In an effort to give our shareholders insight into how ethanol is made at Homeland, we are putting together a four part series describing the process. The focus of Part 1 was Corn, Grain Receiving, Grain Storage, and Grain Cleaning/Milling. Part 2, the focus was Slurry, Liquefaction, and Fermentation. Part 3 focused on how we take the alcohol that is produced in the Fermenters and produce fuel grade ethanol. In this final article, we will focus on the Dried Distillers Grains with Solubles (DDGS) Production Process. As discussed in Part 3, the primary purpose of the Beer Column is to separate the ethanol from the water and solids in the beer stream. The water and solids exit the bottom of the beer column and will eventually be turned into DDGS. This stream, called whole stillage, is sent to a surge tank before being processed in decanter type centrifuges. The wet cake, which still contains approximately 65% moisture, is conveyed over to our DDGS drying system to remove the majority of the remaining moisture. approximately 50% of the water used to make the slurry. The remaining thin stillage that is not used as backset is sent to our evaporators. 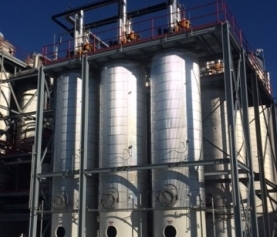 Our evaporator system consists of a train/series of 8 vessels and in each one additional water is evaporated from the thin stillage stream using various heat or energy sources. The water that is evaporated gets condensed and is recycled, similar to the backset, to the slurry system on the front end of the plant. The thin stillage comes into the evaporator train at approximately 8% solids. The material coming out of Evaporator #6, which is typically in the 25% – 28% solids range, is sent thru one of three stack disc centrifuges where 9 – 10 gpm of corn oil is removed. This oil is then stored and loaded onto tank trucks for use as animal feed or a feedstock for biodiesel. The “de-oiled” stream is then sent back to Evaporator #7 for further water removal in the last two vessels. The stream that exits Evaporator #8, is in the 41% – 43% solids range and is called “syrup”. The syrup is sent to our dryers to be combined with the wet cake and ultimately become part of the DDGS product. 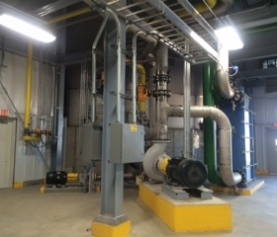 Our DDGS Drying system consists of two sets of 2 dryers for a total of four. All 4 dryers are gas fired and run on average 1000°F in the combustion chamber and 225°F out the back. The wet cake from a set of 3 centrifuges is conveyed to the first dryer in series where the 65% moisture cake it dried down to 35% – 40% moisture cake. This cake is then combined with ½ of the syrup from the evaporators and dried down to a 10% moisture DDGS product. The same thing happens in the other three centrifuges and two dryers. The DDGS product is then cooled, stored, and loaded into either trucks or hopper cars for animal feed all around the world. On average, Homeland will produce 1150 ton of DDGS product every day. In 2015, 80% of our DDGS was exported. When the outside air temperature is cool enough (less than 50° F), a small portion of this water vapor is condensed forming steam or “clouds” coming out the top of the stack. the Dryers the TOs are also gas fired but operate at a much higher temperature, 1500 F, to assure complete combustion. This very hot air then passes across/around a series for tubes with water flowing in them to produce the steam needed for the plant and also conserve energy required to run the plant. 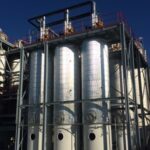 The section that produces the steam is called the Heat Recovery Steam Generator or HRSG. The exhaust out of stack contains 50% moisture (water vapor) and is 350°F. When the outside air temperature is cool enough (less than 50° F), a small portion of this water vapor is condensed forming steam or “clouds” coming out the top of the stack. This is not smoke as demonstrated by the fact that if the ambient air temperature is high enough (greater than 50°F) nothing is visible coming out the top because it is too warm for the water vapor to condense. 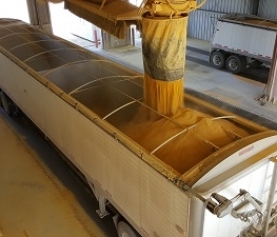 This concludes Part 4 and our series on the ethanol production processes at Homeland. Hopefully you found this information useful and if you ever have any questions or would like to have a tour of the facility, feel free to contact us.